We are a leading Wholesale Trader of counter scale and counter weighing scale from Ahmedabad, India. Our organization is known in the industry for catering a distinguished segment of Counter Scale. The offered counter scale is inspected by our quality controllers on numerous quality parameters so as to provide a perfect range at customer’s end. This counter scale is designed by our professionals utilizing sophisticated tools in fulfillment to set industry norms. As well, this counter scale is available at nominal price in a stipulated time frame. 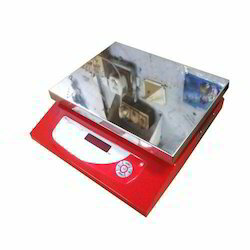 Owing to our expertise in this domain, we are engaged in offering a supreme quality of Counter Weighing Scale. Offered counter scale is manufactured by using high quality of material & modern techniques at our working unit keeping in pace with market standards. This counter scale has immense application in chemical, food, jewelry and research lab. We provide this counter scale in several specifications as per the needs of customers.